Few places in the world have the historic charm of Havana, Cuba. 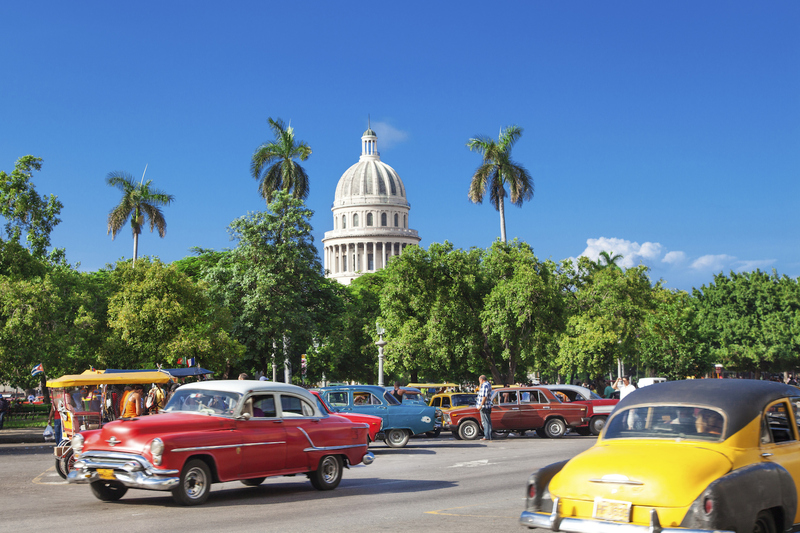 From the cobblestone streets of Old Havana, to the brightly colored 1950s taxis everywhere you turn, a visit to the Cuban capital makes you feel like you’ve stepped back in time. Western Union (WU) has the scoop on 5 must-see attractions in Havana, Cuba that will give you a taste of Cuba’s vibrant culture. Longing for some live music? Look no further than the Callejon de Hamel, a street-turned-art installation in the Afro-Cuban style. Everywhere you look, you’ll be surrounded by funky street murals, offbeat art shops, and quirky sculptures that make for unforgettable photo ops. Don’t get distracted by the art, however, because the best thing about the Callejon is the intense rumba music and dancing that kicks off at noon on Sundays. Get swept away by the drum rhythms that mesmerize both tourists and locals alike. If you love people watching, you won’t be disappointed walking along this 8-km seaside stretch, a meeting place for lovers, friends, poets, fishermen, and musicians. On a hot summer night, it may feel like the whole city is gathered here to meet and greet and admire the ocean waves. Due to the corrosive effects of the water, many of the buildings have fallen into disrepair, but even still, if you’re looking for a local hotspot that’s quintessentially Cuban, the Malecón delivers. If military history is your thing, then the Fortaleza de San Carlos de la Cabaña is a must-stop on your tour of Havana. Built between 1763 and 1774 to protect the city from invaders, this colossal construct is the largest Spanish colonial fortress in the Americas. The fort has been restored, and visitors can enjoy restaurants, bars, shopping, and a cigar store containing the world’s longest cigar. There are even two museums, the Museo de Fortificaciones y Armas and Museo de Comandancia del Che, dedicated to revolutionary Che Guevara. Daytime visitors will enjoy an all-encompassing view of the city, while nighttime visitors will be able to view the nightly cañonazo ceremony, where actors in 18th century garb re-enact the firing of a cannon over the harbor. Yes, this is a cemetery, but don’t be weirded out – this gorgeous 56-hectacre miniature city named for Christopher Columbus is made of bronze, marble, and granite, and is chock-full of rich Cuban history and symbolism. It also happens to be the final resting place of some of Cuba’s most famous 19th and 20th-century artists and luminaries. Some family vaults are actually tiny versions of the owners’ mansions, complete with architectural details like arches and stained-glass windows. Start your tour at the information office, where you can purchase a guidebook with a detailed map, or inquire about hiring a personal guide. For a taste of Cuba’s art culture, look no further than the Museo Nacional de Bellas Artes (National Museum of Fine Art). The museum, which is broken up into two separate sites, houses an extensive collection of international art, including everything from 2000-year-old Roman mosaics to modern-day Cuban pop art. If you want to focus solely on Cuban art, choose the Arte Cubano section of the museum, and enjoy famous works from Cuban artists such as Raúl Martínez, Guillermo Collazo, and Wilfredo Lam. Have you visited Havana, and if so, what were your favorite sights to see? Let us know in the comments!